Use session replay to see the website experience you actually deliver to your customers across desktop, mobile and tablet devices. Watch exactly how users interact with your website to understand the problems, issues and errors that need to be optimized to improve your website usability (UX) and conversion. See mouse movements, clicks/taps, masked form input, page scrolling and mobile gestures like pinch, zoom, tap, double tap, swipe, tilt and screen resizing. SessionCam records an exact version of the page as seen by the user at the time of use; including the HTML, CSS and all images. Recordings can be stored for up to 12 months on our “Enterprise” plan. Track all your website visits and intelligently trigger recordings for your highest value visits only such as those where customers struggle, abandon or hit errors. Or, sessions that relate to A/B tests or where a customer survey has been completed. SessionCam ranks recordings based on our unique metric: Customer Struggle Score. 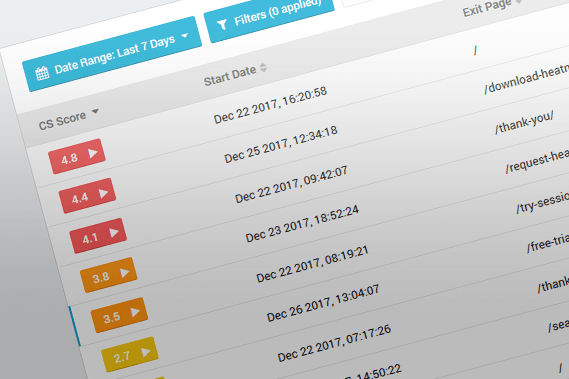 Using this, you can quickly identify sessions where your website visitors have struggled the most without having to watch endless recordings. SessionCam includes over 20 pre-defined filters that can also be used to segment website recordings into areas of high interest such as hostname, browser type, device type, operating system, screen resolution, location, customer struggle score, entry page, page visited, exit page, number of pages within the session, time on page and referring URL. Session replay is an essential tool for improving your website UX and optimizing for conversion. Watch replays of your users as they drop-off your conversion funnels and forms and hit website errors. SessionCam integrates beautifully with Google Analytics and Adobe Analytics. 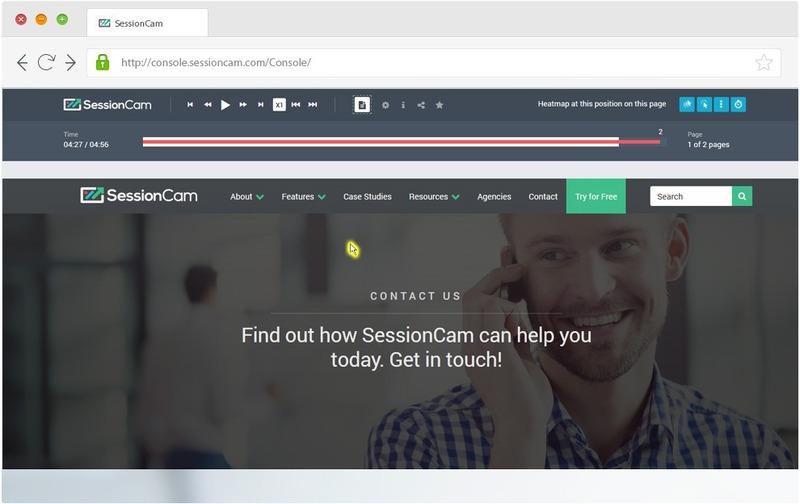 Watch SessionCam recordings within Google Analytics and Adobe Analytics and use Google Analytics and Adobe Analytics segments to filter the data for recordings, heatmaps and conversion funnels within SessionCam.